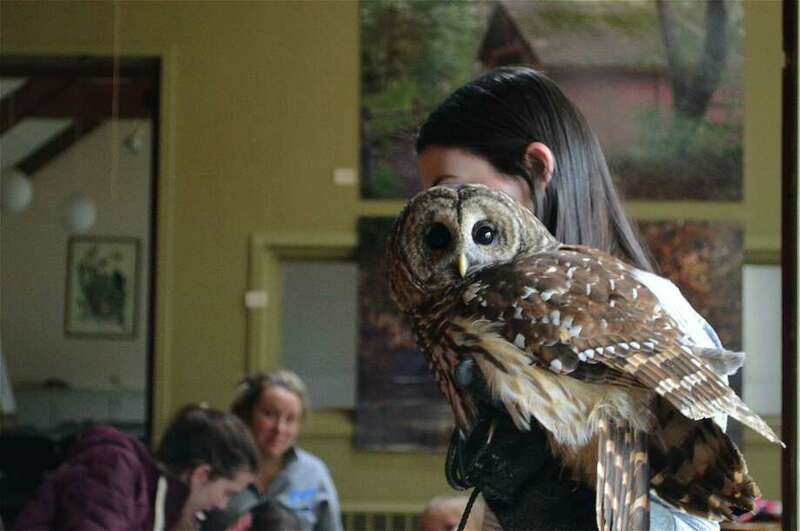 Brisby the barred owl makes an appearance at the Connecticut Audubon Society's owl program, Saturday, Jan. 19, 2019, in Fairfield, Conn.
FAIRFIELD — Children and adults alike had a hoot at the Connecticut Audubon Society on Saturday afternoon when the center hosted an owl-related program featuring story time and a visit from two of its nocturnal habitues. “This is the first public program we’ve had him in,” teacher and naturalist Jill Mahar said of Uno, a rescued screech owl that was hit by a car and has rehabilitated at the center for about a year. There was also a barred owl named Brisby in attendance. Mahar explained the indoor program is a good chance for visitors to get back to nature despite inclement weather. “Families are more likely to come, learn about the center and learn about the wildlife that’s natural to the state, but not freeze,” she said.